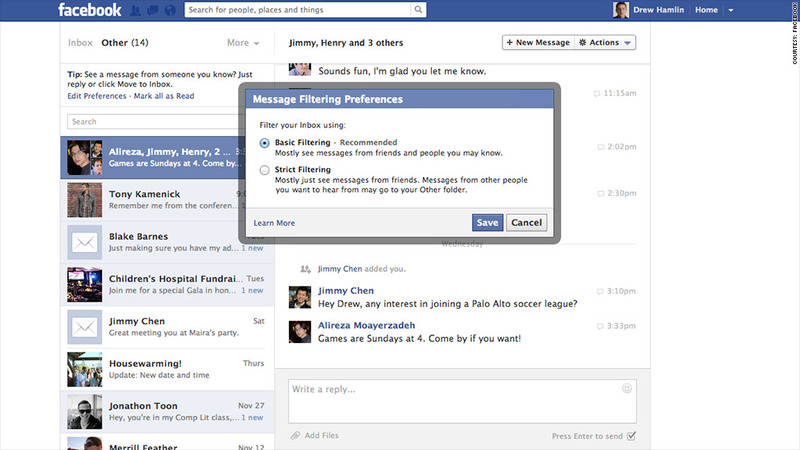 Facebook is updating its messaging service with new filters and paid messages. Facebook is trying out a new messaging system that allows people to pay to have their messages delivered directly to the inboxes of people they're not friends with. The test, which will only be available to a "small number of people" in the United States, is Facebook's response to a common user complaint: that important messages are getting lost in the social network's spam filter. Currently, Facebook delivers messages it thinks are relevant to users' inbox -- messages from friends, or friends of friends -- but other messages that Facebook believes are spam get sent to a little-noticed "other" folder. That "other" folder is littered with mostly unwanted messages from people not connected with the user. But on occasion, those out-of-network messages may be important. Facebook (FB) says it uses a combination of complex algorithms and social connections to determine whether messages are relevant. It also will begin rolling out a new filtering tool that allows users to choose whether they want "strict" filtering -- "mostly messages from friends," according to Facebook's blog post -- or "basic" filtering -- "mostly messages from friends and people you may know." But even then, Facebook users may miss relevant messages that the social network deems unworthy of the inbox. That's why the company says a paid model could work. "If you want to send a message to someone you heard speak at an event but are not friends with, or if you want to message someone about a job opportunity, you can use this feature to reach their inbox," the company said in its blog. "For the receiver, this test allows them to hear from people who have an important message to send them." Facebook didn't say how much the service would cost. But the company is being cautious at the outset: Facebook said it is limiting the test to people -- not businesses -- and users will only be able to receive one paid message in their inbox per week.